For other uses, see Fast Car (disambiguation). "Fast Car" is a song written and recorded by American singer Tracy Chapman. It was released on April 6, 1988 as the lead single from her 1988 self-titled debut studio album. Her appearance on the Nelson Mandela 70th Birthday Tribute was the catalyst for the song's becoming a top-ten hit in the United States, peaking at number six on the Billboard Hot 100. In the United Kingdom, it peaked at number four on the UK Singles Chart. "Fast Car" received two Grammy nominations for Record of the Year and Song of the Year, as well as a MTV Video Music Award nomination for Best Female Video in 1989. According to Metro Weekly critic Chris Gerard, "Fast Car" tells a grittily realistic story of a working poor woman trying to escape the cycle of poverty, set to folk rock music. The song's arrangement was described by Orlando Sentinel writer Thom Duffy as "subtle folk-rock", while Billboard magazine's Gary Trust deemed the record a "folk/pop" song. Dave Marsh said it was perhaps an "optimistic folk-rock narrative", whose characters are in a homeless shelter. Rolling Stone ranked the song number 167 on their list of the 500 Greatest Songs of All Time. It is Chapman's only song on the list (and the highest ranking song both written and performed by a female artist). Pitchfork placed the song at number 86 on their list of the 200 Best Songs of the 1980s. In April 2011 the track also hit the UK top ten at number 4 after Michael Collings performed it on Britain's Got Talent. The single was certified Platinum in the United Kingdom by the British Phonographic Industry (BPI) in 2014, based on digital downloads and streaming. The song has sold 661,500 copies in the United Kingdom, as of January 2016. In 2015, a tropical house cover of "Fast Car" was released by British record producer Jonas Blue. It is Blue's debut single and features the vocals from British singer Dakota. It is the lead single of Blue’s debut album Blue. The Club Mix was included on Blue's compilation, Jonas Blue: Electronic Nature – The Mix 2017. In an interview with iHeartRadio, Blue stated, "When I was growing up, it was just a very varied type of music. My dad schooled me on soul, funk, disco, things like that. It was very varied. And then my mum was kind of more pop, and ABBA, things like that, Tracy Chapman. So it was a very varied sound growing up, lots of different big acts, and great songwriters. And [they all] definitely influenced me into what I'm doing today." 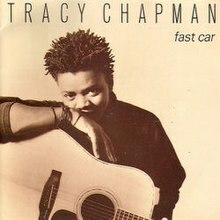 Regarding "Fast Car", Chapman's original 1988 hit is a favorite of Blue's mother's, who would often play it in the car. "It was a good song in London [during] that time when I was growing up, so it was always on the radio," he went on to say. "And it just kind of stuck with me. It was that song on the long journeys, and I loved it." Regarding Dakota, who provides vocals on the song, Blue said, "I met Dakota with my manager. I had actually finished the instrumental of 'Fast Car', and we were looking for a singer. But on this particular night, we went out, we weren't obviously looking for the singer. We just went to this pub for a beer, and this pub is kind of renowned for its new acts and unsigned artists and things like that. So, we're upstairs having a beer and all of a sudden we hear this voice from the basement downstairs of this pub, and I said, 'We've got to go down and check whoever that is up.' We went downstairs and Dakota was there, and we never met her before. At the end of the show, went up to her and said, 'I've done this cover of 'Fast Car' and I think you'd be great on it.' And she [said], 'Oh, I've never done dance music before or anything like that so, I'm not kind of sure.' And I was like, 'Listen, you'd be great.' And she came the next day to record it, and what you hear on the radio is her coming in the next day after her show to record it." Blue also admitted that he wanted to create a Swedish-esque sound on the record: "I think with things like the synth lead lines in it, giving it that second hook, I was kind of going for a very kind of Swedish-y kind of sound. That's kind of the influence behind that kind of lead synth line, and that was something which I don't think people have picked up on yet, but they just like the song because of what it is." The Jonas Blue version peaked at number two on the UK Singles Chart, behind Zayn Malik's "Pillowtalk". Its UK peak meant it charted higher than Chapman's original, which peaked at number five on the chart in May 1988 and a position higher upon a re-release in April 2011. Outside the United Kingdom, the Jonas Blue version reached number one in Australia. and Hungary, whilst also peaking within the top ten in Germany, Ireland, Italy, the Netherlands, Belgium, New Zealand and Sweden. In the United States, the Jonas Blue version went to number one on the Dance Club Songs chart. 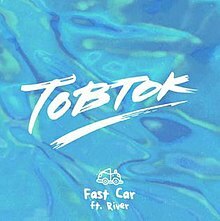 In 2016, another tropical house version was released by Swedish record producer Tobtok, featuring the vocals from British singer River. Tobtok also released an accompanying music video. The Tobtok version also charted in a number of charts, notably Australia, where it received significant airplay and reached number 19 on the charts. The Tobtok version also charted in the Norwegian VG-lista, Irish IRMA and Danish Tracklisten official charts. The song has been covered many times including by The Flying Pickets, Hundred Reasons, Xiu Xiu, Vertical Horizon, Darwin's Waiting Room, Amazing Transparent Man, MYMP, Mutya Buena, Kristian Leontiou, Wayne Wonder, David Usher, Linda Pritchard, Boyce Avenue (featuring Kina Grannis), Christian Kane, Mark Wilkinson, Elizabeth Gillies, Hitomi Yaida, Ryan Montbleau (featuring Tall Heights) and Jess Moskaluke (with W.G. Snuffy Walden). In 2010, Kelly Clarkson and Daughtry performed a duet of the song in concert. It was also sampled by the rap group Nice & Smooth in their hit song "Sometimes I Rhyme Slow", making it a hit within the hip-hop community as well. British rapper Example also samples the song in his "I Need a Fast Car", which appeared on his mixtape We Didn't Invent the Remix. In 1991, British soul singer Gabrielle recorded a demo of her song "Dreams" that featured a sample of "Fast Car". When it was released commercially in 1993 the sample was removed because of legal issues, but the version with the sample was still being played in nightclubs and DJ sets. Los Angeles-based turntablist DJ Quixotic is known to perform a cover of "Fast Car" by manipulating a tone record on a turntable to imitate the notes of the opening guitar riffs. In 1991, Hong Kong band Soft Hard covered this song in Cantonese. The song was parodied as "I Write a Fast Song" in the In Living Color sketch "Making of a Tracy Chapman Song", in which Chapman (portrayed by Kim Wayans) writes a song by looking out her window and witnessing events such as an old man getting hit by a bus and a domestic dispute. The song was featured in an episode of Jake and Amir, however the words are changed to "I got a fast Jake". In June 2006, Canadian country music trio The Wilkinsons recorded a version of the song for their 2007 album Home. A noticeable change in the lyrics of their version is that vocalist Amanda Wilkinson replaces the line "We'll get out of this shelter" with "We'll move out of this trailer". In mid-2008, Swimming With Dolphins released a recording of the song as a B-side track to their EP, Ambient Blue. In December 2010, Boyce Avenue and Kina Grannis did an acoustic arrangement; as of October 2014 it had over 25 million views on YouTube and remains one of their most popular songs on iTunes. In April 2011, Michael Collings auditioned on Britain's Got Talent by singing his version of "Fast Car". As a result, the song peaked on number four in the UK Singles Chart in the United Kingdom, a position higher than its original peak in the country 23 years prior. In September 2014, Sam Smith covered the song on BBC Radio 1's Live Lounge, as did British singer Birdy in April 2016. "Fast Car" appears as first track on the album Oui Can Luv by Andy Allo featuring Prince on guitar. British singer Jasmine Thompson released a cover of the song in a tropical style in January 2016. Country music singer Christian Kane recorded a cover of the song, which was featured on his 2015 album, Welcome to My House! Lee Brice's 2012 single "Hard to Love" was heavily influenced by the song. In 2015, Kenyan pop group Sauti Sol sampled the song in their single called "Nerea". ^ Gerard, Chris (July 7, 2015). "The 50 Greatest Pop Songs of the '80s, Nos. 40-31". Metro Weekly. Retrieved February 1, 2017. ^ Duffy, Thom (September 6, 1988). "Poverty And Despair Crack The Top 10 Tracy Chapman Puts Social Issues To Music". Orlando Sentinel. Retrieved February 1, 2017. ^ Trust, Gary (February 20, 2016). "Tracy Chapman's Folk Classic 'Fast Car' Charts, Thanks to Two Dance Remakes". Billboard. Retrieved January 21, 2017. ^ Marsh, Dave (April 1996). "Rock 'n' Revolution". Mother Jones. p. 16. Retrieved February 1, 2017. ^ "The RS 500 Greatest Songs of All Time". Rolling Stone. 2004-12-09. Retrieved 2010-01-15. ^ "The 200 Best Songs of the 1980s". Pitchfork. August 23, 2015. Archived from the original on June 14, 2016. ^ "Britain's Got Talent helps Fast Car speed into chart". BBC News. 24 April 2011. Retrieved 1 February 2016. ^ "Australian-charts.com – Tracy Chapman – Fast Car". ARIA Top 50 Singles. ^ "Ultratop.be – Tracy Chapman – Fast Car" (in Dutch). Ultratop 50. ^ "The Irish Charts – Search Results – Fast Car". Irish Singles Chart. ^ "Charts.nz – Tracy Chapman – Fast Car". Top 40 Singles. ^ "Nederlandse Top 40 – Tracy Chapman" (in Dutch). Dutch Top 40. ^ "Dutchcharts.nl – Tracy Chapman – Fast Car" (in Dutch). Single Top 100. ^ "Swedishcharts.com – Tracy Chapman – Fast Car". Singles Top 100. ^ a b "Tracy Chapman: Artist Chart History". Official Charts Company. ^ a b c "Fast Car: Rolling Stone". Rolling Stone. 2004-12-09. Retrieved 2010-01-15. ^ "Tracy Chapman Album & Song Chart History". Billboard. Retrieved 2010-01-15. ^ "Danishcharts.com – Tracy Chapman – Fast Car". Tracklisten. ^ "Offiziellecharts.de – Tracy Chapman – Fast Car". GfK Entertainment Charts. ^ "Danish single certifications – Tracy Chapman – Fast Car". IFPI Denmark. Scroll through the page-list below until year 1988 to obtain certification. ^ "Italian single certifications – Tracy Chapman – Fast Car" (in Italian). Federazione Industria Musicale Italiana. Select "1988" in the "Anno" drop-down menu. Select "Fast Car" in the "Filtra" field. Select "Singoli online" under "Sezione". ^ "British single certifications – Tracy Chapman – Fast Car". British Phonographic Industry. Select singles in the Format field. Select Platinum in the Certification field. Type Fast Car in the "Search BPI Awards" field and then press Enter. ^ "Fast Car (feat. Dakota) [Radio Edit] – Single by Jonas Blue". iTunes Store. Apple Inc. Retrieved 8 February 2016. ^ Alexandria Symonds (March 16, 2016). "Dancing Away From the Bleak Life With 'Fast Car'". The New York Times. Retrieved January 21, 2017. ^ Garratt, Rob (May 18, 2016). "Jonas Blue on his Fast Car remix: 'It was pretty much the song of my childhood'". The National. Retrieved January 21, 2017. ^ Deen, Khyle (25 January 2016). "Jonas Blue releases music video to global smash hit Fast Car feat. Dakota (VIDEO)". Purple Revolver. Retrieved 8 February 2016. ^ a b c d Mastrogiannis, Nicole (March 24, 2016). "INTERVIEW: Who Is Jonas Blue? Everything You Need to Know". iHeartRadio. Retrieved July 11, 2016. ^ Gibsone, Harriet (February 5, 2016). "Zayn Malik's debut solo single Pillowtalk goes straight to No 1". The Guardian. Guardian Media Group. Retrieved February 8, 2016. ^ Myers, Justin (20 April 2018). "12 cover versions that charted higher than the originals". Official Charts Company. Retrieved 20 April 2018. ^ Ryan, Gavin (30 January 2016). "ARIA Singles: Jonas Blue 'Fast Car' Is Australia's No 1". Noise11. Retrieved 30 January 2016. ^ "Fast Car (feat. Dakota) [Radio Edit] – Single by Jonas Blue on Apple Music". iTunes Store (AU). Retrieved May 14, 2017. ^ "Fast Car (feat. Dakota) [Remixes] – EP by Jonas Blue on Apple Music". iTunes Store (AU). Retrieved May 14, 2017. ^ "Fast Car (feat. Dakota) [Acoustic] – Single by Jonas Blue on Apple Music". iTunes Store (AU). Retrieved May 14, 2017. ^ "Australian-charts.com – Jonas Blue feat. Dakota – Fast Car". ARIA Top 50 Singles. ^ "Austriancharts.at – Jonas Blue feat. Dakota – Fast Car" (in German). Ö3 Austria Top 40. ^ "Ultratop.be – Jonas Blue feat. Dakota – Fast Car" (in Dutch). Ultratop 50. ^ "Ultratop.be – Jonas Blue feat. Dakota – Fast Car" (in French). Ultratop 50. ^ "Jonas Blue Chart History (Canadian Hot 100)". Billboard. ^ "ČNS IFPI" (in Czech). Hitparáda – Radio Top 100 Oficiální. IFPI Czech Republic. Note: Change the chart to CZ – RADIO – TOP 100 and insert 201611 into search. ^ "ČNS IFPI" (in Czech). Hitparáda – Digital Top 100 Oficiální. IFPI Czech Republic. Note: Change the chart to CZ – SINGLES DIGITAL – TOP 100 and insert 201611 into search. ^ "Danishcharts.com – Jonas Blue feat. Dakota – Fast Car". Tracklisten. ^ "Jonas Blue: Fast Car (Feat. Dakota)" (in Finnish). Musiikkituottajat – IFPI Finland. ^ "Lescharts.com – Jonas Blue feat. Dakota – Fast Car" (in French). Les classement single. ^ "Offiziellecharts.de – Jonas Blue feat. Dakota – Fast Car". GfK Entertainment Charts. ^ "Chart Track: Week 8, 2016". Irish Singles Chart. ^ "Top Digital - Classifica settimanale WK 15 (dal 2016-04-08 al 2016-04-14)" (in Italian). Federazione Industria Musicale Italiana. Retrieved 15 April 2016. ^ "Latvijas Top 40". Latvijas Radio. 3 April 2016. Retrieved 3 April 2016. ^ "The Official Lebanese Top 20 – Jonas_Blue". The Official Lebanese Top 20. Retrieved 10 April 2016. ^ "Nederlandse Top 40 – Jonas Blue Featuring Dakota" (in Dutch). Dutch Top 40. ^ "Dutchcharts.nl – Jonas Blue feat. Dakota – Fast Car" (in Dutch). Single Top 100. ^ "Charts.nz – Jonas Blue feat. Dakota – Fast Car". Top 40 Singles. ^ "Norwegiancharts.com – Jonas Blue feat. Dakota – Fast Car". VG-lista. ^ "Listy bestsellerów, wyróżnienia :: Związek Producentów Audio-Video". Polish Airplay Top 100. Retrieved April 11, 2016. ^ "ČNS IFPI" (in Slovak). Hitparáda – Radio Top 100 Oficiálna. IFPI Czech Republic. Note: insert 201624 into search. ^ "ČNS IFPI" (in Slovak). Hitparáda – Singles Digital Top 100 Oficiálna. IFPI Czech Republic. Note: Select SINGLES DIGITAL - TOP 100 and insert 201612 into search. ^ "Spanishcharts.com – Jonas Blue feat. Dakota – Fast Car" Canciones Top 50. ^ "Swedishcharts.com – Jonas Blue feat. Dakota – Fast Car". Singles Top 100. ^ "Swisscharts.com – Jonas Blue feat. Dakota – Fast Car". Swiss Singles Chart. ^ "Jonas Blue Chart History (Hot 100)". Billboard. ^ "Jonas Blue Chart History (Hot Dance/Electronic Songs)". Billboard. ^ "Jonas Blue Chart History (Dance Club Songs)". Billboard. ^ "Jonas Blue Chart History (Dance Mix/Show Airplay)". Billboard. Retrieved April 26, 2016. ^ "Canadian Hot 100 Year End 2016". Billboard. Prometheus Global Media. Retrieved December 8, 2016. ^ "Összesített singles- és válogatáslemez-lista – eladási darabszám alapján - 2016". Mahasz. Retrieved January 15, 2017. ^ "ARIA Charts – Accreditations – 2017 Singles". Australian Recording Industry Association. ^ "Austrian single certifications – James Blue ft. Dakota – Fast Car" (in German). IFPI Austria. Retrieved 12 January 2018. Enter James Blue ft. Dakota in the field Interpret. Enter Fast Car in the field Titel. Select single in the field Format. Click Suchen. ^ "Canadian single certifications – Jonas Blue – Fast Car". Music Canada. ^ "Gold-/Platin-Datenbank (Jonas Blue; 'Fast Car')" (in German). Bundesverband Musikindustrie. Retrieved 19 May 2017. ^ "Italian single certifications – Jonas Blue feat. Dakota – Fast Car" (in Italian). Federazione Industria Musicale Italiana. Retrieved November 21, 2016. Select "2016" in the "Anno" drop-down menu. Select "Fast Car" in the "Filtra" field. Select "Singoli online" under "Sezione". ^ "New Zealand single certifications – Jonas Blue feat. Dakota – Fast Car". Recorded Music NZ. Retrieved April 1, 2016. ^ "Polish single certifications – Jonas Blue feat. Dakota – Fast Car" (in Polish). Polish Society of the Phonographic Industry. Retrieved 25 January 2017. ^ "Guld- och Platinacertifikat" (in Swedish). IFPI Sweden. Retrieved 2 February 2017. Type Jonas Blue Featt. Dakota in the top right search bar. Click on "Sok" and select "Visa" under Fast Car to see certification. ^ "British single certifications – Jonas Blue feat. Dakota – Fast Car". British Phonographic Industry. Retrieved 30 June 2017. Select singles in the Format field. Select Platinum in the Certification field. Type Fast Car in the "Search BPI Awards" field and then press Enter. ^ "American single certifications – Jonas Blue – Fast Car". Recording Industry Association of America. If necessary, click Advanced, then click Format, then select Single, then click SEARCH. ^ "Fast Car (feat. River) [Radio Edit] – Single by Tobtok". iTunes Store. Apple Inc. Retrieved 11 February 2016. ^ Wass, Mike (January 4, 2016). "Battle of the "Fast Car" Covers: Jonas Blue Ft. Dakota Vs. TobTok Ft. River". Idolator. Retrieved February 8, 2016. ^ "Australian-charts.com – Tobtok feat. River – Fast Car". ARIA Top 50 Singles. ^ "Danishcharts.com – Tobtok feat. River – Fast Car". Tracklisten. ^ "Chart Track: Week 3, 2016". Irish Singles Chart. Retrieved February 13, 2016. ^ "Norwegiancharts.com – Tobtok feat. River – Fast Car". VG-lista. ^ "Listy bestsellerów, wyróżnienia :: Związek Producentów Audio-Video". Polish Airplay Top 100. Retrieved March 14, 2016. ^ "Top 5 Airplay TV". Polish Video Chart. ZPAV. Retrieved February 6, 2017. ^ Ryan, Gavin (March 5, 2016). "ARIA Singles: Lukas Graham Is No 1 for Third Week". Noise11. Retrieved March 5, 2016. ^ ""Fast Car" (Swimming With Dolphins cover) on SoundCloud". SoundCloud. Retrieved May 9, 2014. ^ Fast Car. YouTube. May 18, 2013. ^ "Britain's Got Talent helps Fast Car speed into chart". BBC News. 2011-04-24. ^ Blistein, Jon (September 4, 2014). "Sam Smith Offers Delicate Cover of Tracy Chapman's 'Fast Car'". Rolling Stone. Retrieved September 12, 2014. "Nothing but Love (Standing in the Way)"
This page was last edited on 17 April 2019, at 01:08 (UTC).